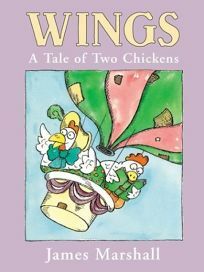 Another of James Marshall's beloved books returns, Wings: A Tale of Two Chickens (1986), in which Winnie the chicken, who doesn't read, finds herself prey to a fox. It's up to feathered Harriet to rescue her pal. ""There is more here than just a hilarious plot,"" wrote PW upon its original 1986 publication. ""Very real characters, a plug for reading, a warning about strangers and animated, breezy art full of detail. Marshall is in top form here.""